Proxy Mobile IPv6 (or PMIPv6 for short) allows an ordinary host (PC, Laptop, Smartphone etc.) to use a non changing IP address while roaming between different access points/routers within a PMIP domain. See Wikipedia for more info’s. Cisco offers a powerful implementation in its IOS targeted at large scale installations with regard to ease of deployment and management. For this to work Cisco recommends things like Lightweight Access Points - LAP, Wireless LAN Controllers - WLC and protocols like Control And Provisioning of Wireless Access Points - CAPWAP. 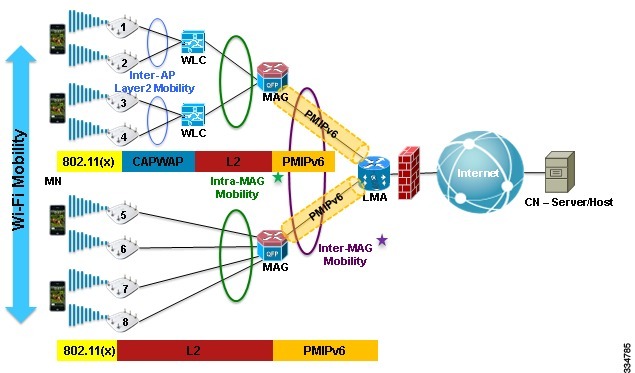 Using these components its fairly easy to setup and manage PMIPv6 domains. See this Cisco guide for more infos. For a project I had to design a very, very low level PMIPv6 lab without almost all the nice things Cisco recommends. And - it works - almost. In times of Carrier IQ and other unwanted pieces of software possibly active on your mobile phone it would be nice to have tools like on your desktop PC to see whats going on. One of these tools on a PC is WireShark, a network sniffer. Unfortunately it only runs on PC’s (either Windows or Linux) and not on your SmartPhone. So how would it be possible to trace your phones network traffic? Some Windows Mobile 6.x phones have a very nice feature which allows you to get notified if someone removes your SIM card from your phone (e.g. in case it was lost or stolen) and inserts another one. Unfortunately this feature is buried very deep in config menus for example on a Windows Mobile 6.5 phone (Samsung Omnia B-7350). It’s called uTrack or MobileTracker. This post shows a step by step guide how to enable this feature and what happens in case of a SIM change.